Your body needs water to survive and function properly. When you exercise, are ill or are exposed to heat or humidity, you need even more. Since your body is constantly losing fluid through sweat, urine and respiration, it is important to drink throughout the day. However, it is possible to consume too much fluid. Some medical conditions require a restriction of fluid intake to avoid complications. Your body needs water to maintain a normal temperature; to lubricate and cushion your joints; to protect your spinal cord and other sensitive tissues; and to get rid of wastes through urination, perspiration and bowel movements. To replace this loss, get 8 to 12 cups of water a day or 1 quart of water for every 50 lb. of body weight, according to Clemson Cooperative Extension. The exact amount may be more or less depending on your age, medical conditions, medications, level of physical activity and exposure to weather. Drink enough fluids so that you do not feel thirsty -- thirst is an early warning sign of dehydration. Your urine should be clear to light yellow. Water, milk, soymilk, juice, soup, fruits and some vegetables all help to meet your daily fluid needs. 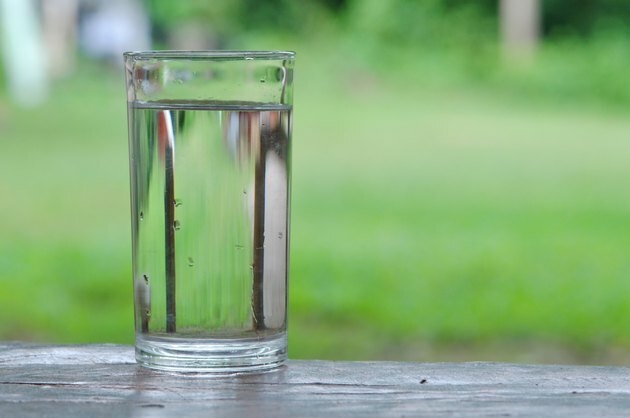 Drinking too much water can lead to a potentially fatal condition called water intoxication. It takes a lot of water to reach this stage, which tends to occur in runners who exercise for more than four hours and consume enough fluids to gain weight during the run. Consuming too much water depletes your level of sodium, and you need sodium to regulate the amount of fluid in your body. A low level of sodium, called hyponatremia, can cause your cells to swell. When this occurs in the cells of the brain, you could go into a coma or die, says MayoClinic.com. Since each person's water needs are different, there is no one set amount of water intake that is dangerous for everyone. The best bet is to stick to your doctor's recommendations on how much is safe to drink. Be on the lookout for rapid, unexplained weight gain, nausea, confusion and vomiting. Heart failure is diagnosed when your heart muscle is no longer strong enough to pump the blood the body needs to carry out everyday functions. You can live with heart failure but may experience fatigue, trouble breathing, chest pain and many other symptoms. Part of managing heart failure is being careful about your fluid intake; the more fluid there is in the body, the harder the heart has to work to pump it. Your physician will tell you how much is safe to drink, and that amount includes all fluids. The best bet is to spread your fluid intake throughout the day and weigh yourself daily, according to the University of Pittsburgh Medical Center. You need to call your doctor if you gain 2 or 3 lb. overnight or more than 1 lb. each day for three days in a row. Your kidneys are responsible for maintaining the right fluid balance and filtering the fluid for wastes. If you are living with kidney disease, you will need to monitor your fluid intake to avoid overworking your kidneys. Common signs that you are drinking too much fluid include swelling in the feet and ankles, elevated blood pressure, weight gain and fluid buildup around the lungs leading to shortness of breath, notes the American Association of Kidney Patients. Along with beverages, you may also need to limit your intake of ice, ice pops, gelatin, ice cream, sauces, gravies and soups.